Doris Long has been singing jazz and standards around town since 1963. She has performed with a who’s who of the local music scene, with long running stints at such great places out of the past as Sammy’s and the Theatrical. It is amazing she has never put out a solo recording before, and her recently released Long Overdue is appropriately titled. 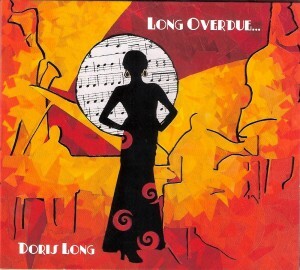 Long Overdue finds Doris Long backed by some great local musicians, including Joe Hunter on piano, Dallas Coffey on bass, Val Kent on drums, and Al Fuller on sax. The seventeen cuts on the disk are all standards done the right way, with arrangements that not only let Long’s vocals shine, but also the musicianship of the band behind her. They do a great job on songs like Jimmy Van Huesen’s “Oh You Crazy Moon”; the Gershwin Brothers’ “For You, For Me, Forevermore”; and Cole Porter’s “I Concentrate on You.” I really like the versions of Duke Ellington’s “Drop Me Off in Harlem” and the Fred Rose/Walter Hirsh classic “Deed I Do.” Both really show off the band, especially pianist Hunter and bassist Coffey in the Ellington tune, and sax player Fuller in the other. Doris Long is in her eighth year playing Friday nights at the Waterbury Coach House on Madison. She starts at 7:00 and is backed by Hunter and Coffey. Check her out sometime, she and her music are one of the best kept secrets in local music scene.